We want a world free from single-use toxic plastics for everyone, everywhere by 2030! We'll use every signature we collect to make sure world leaders 'Make Waves' about hazardous plastics. Alternatively, find us at Glastonbury Festival 2017! Have you got the bottle for Shambala? Raw Foundation has teamed up with Shambala Festival and Frank Water to produce a reusable, 100% 750ml stainless steel water bottle. At this year’s Shambala Festival, Raw Foundation has teamed up with Shambala and Frank Water to reduce the amount of single-use plastic used and brought onto the festival site. As part of their campaign, Raw Foundation is ‘Making Waves’ again at this year’s Shambala festival to create a hullabaloo about the true extent of plastic pollution and its impacts! A dynamic art exhibition and jam-packed timetable of activities and workshops for kids and adults will provide an opportunity to connect festival-goers to this critical global issue. We hope to raise awareness, inspire action and creative rebellion to reduce plastic consumption. So, if you are a festival-goer interested in a plastic free future (or indeed keen to reduce festival waste) join us and GET INVOLVED! As part of the campaign with Raw Foundation to encourage event and festival organisers to reduce plastics at their events, Shambala are leading the way to reduce the amount of single-use plastic on site and encourage Festival-goers to bring their own reusable water bottles or buy a stainless steel bottle instead of buying bottled water. They cause an enormous amount of needless waste, especially as the Festival provides free tap water across the site. You can fill your bottle for free at any of their drinking water taps. Every piece of plastic ever made still exists somewhere and the effects these types of plastics have on the environment are huge – with an estimated 150 million tonnes of plastic currently littering our earth and oceans. We hope you’ll join us, to help make Shambala 2014 as plastic-free as possible – and save yourself a few quid on bottled water in the process! As well as filling your water bottle from any of the drinking water taps on site, you will be able to pick up a reusable bottle and refill it for free with unlimited chilled water from one of their fixed refill stations or mobile units. Here, you can also learn more about the charity’s incredible work to provide clean water in rural India. They will also be reminding festival-goers how lucky we are to have taps and safe water sources in the UK – so rather than buying plastic bottles that will ruin the site, buy a reusable bottle and drink fresh tap water all festival! Raw Foundation will be raising awareness about the hidden consequences of plastic pollution and its impacts and focusing on simple solutions which we hope will change thinking and behaviour about plastic. Our Plastic-Free Festival-Goers Guide will cover everything from the stark reality about plastics to festival-specific advice and tips. The guide aims to give individuals a single source reference to the things they also need to take into consideration to reduce their plastic footprint in a wider context, but without being prescriptive. We’re hoping to encourage people to avoid single use plastics, carry a reusable bottle with them, and not rely on buying plastic water bottles each time they want to drink! Come and find us at the festival and sign our petition, to amplify the ‘message’ for whole sector change and call on world leaders to put an end to single use toxic plastics. We’ll use every signature we collect at Shambala to make sure world leaders Make Waves about hazardous (or toxic) plastics at the UN General Assembly, and prove that a world free from single use plastic for everyone, everywhere by 2030 isn't just a pipe dream! Visit us at the Frank Water stand. Enjoy a free glass of water, get a free Raw wristband and sign our petition, calling on world leaders to put an end to single use toxic plastics. Pick up a Shambala festival water bottle. Cut down on the plastic with one of our brilliant reusable bottles. Pick up a free Plastic-Free Festival-Goers Guide. Learn about the true extent of plastic pollution and its impacts and focus on the solutions. Drop in to one of our workshops to find out more, share our experience and passion and help us create more mayhem than ever! Tweet your support. Just use #makingwaves to spread the word. For those of you who don’t yet have a reusable water bottle, our reusable 100% stainless steel 750 ml water bottles are priced at £10 and are a not-for-profit initiative. You can purchase a bottle during the festival from the Frank Water stand on site. Raw Foundation helps to educate, engage and empower young people to move towards sustainable consumption and production. Everything we do is systems-focused, solution-oriented and change-driven. “Nothing better illustrates our throw-away lifestyle and waste problems than plastic. It has become one of the most serious environmental and human health problems facing us today”. Raw Foundation's Making Waves campaign aims to reduce the amount of oil-based plastic in the environment by raising awareness about the true extent of plastic pollution and its impacts. By providing individuals with the tools to take action, we hope to inspire behaviour change and mobilise young people to reduce their plastic consumption and implement healthy, fair, sustainable solutions. 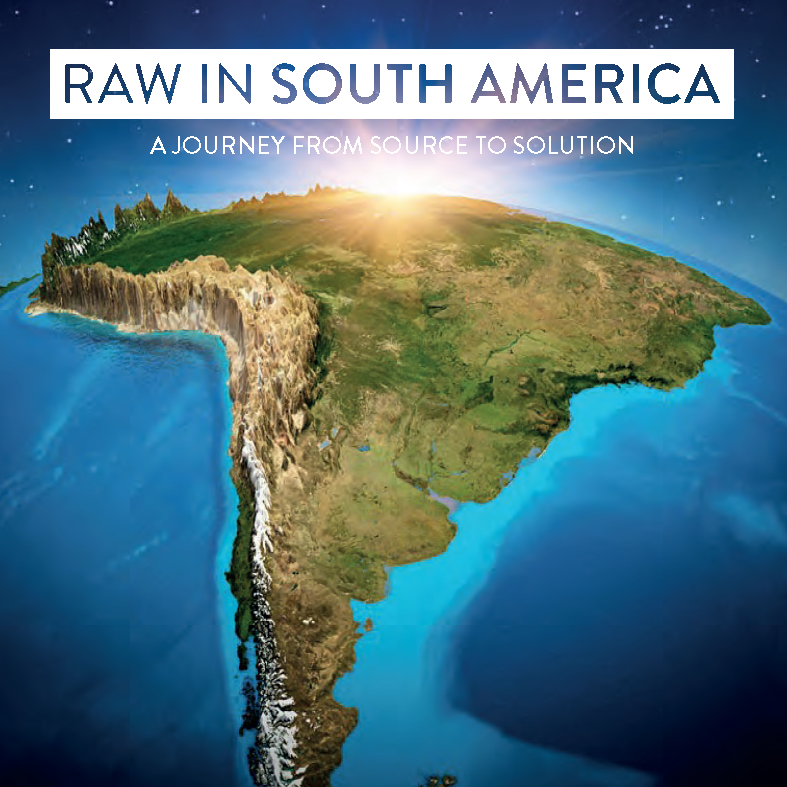 Raw in South America expedition off to track pointless plastic soon! Through our learning programmes, collaboration and campaigns we aim to change attitudes and inspire young people to work towards a sustainable future. In a world facing radical change, together we can make a difference for all our childrens sake. Your donation, no matter how large or small, will enable us to continue developing our work. Sign our petition, to amplify the message for whole sector change and call on world leaders to put an end to single use toxic plastics.